• My biggest disappointment from this season has been the fact the Bears hadn’t been able to establish an identity, but that might have changed on Sunday. The Bears dominated the line of scrimmage against a team that ranks in the top 10 in both rushing offense and defense. If they can run and stop the run with the best, they’re going to win quite a few games. • The Bears just looked like a completely different team than the one we’ve seen the last three weeks. They were physical and intense. I loved how the defense attacked the line of scrimmage. It’s fair to wonder how much of that has to do with John Timu. • Another injury on Sunday lowered Forte’s price tag. 30-year-old running backs don’t typically get paid much, but that’s especially true when they’re coming off of injury-plagued years. Forte is still the Bears best running back and if they can get him back for a deal similar to what Frank Gore signed last year, why not do it? He’s averaging about half a yard more per carry than the combination of Langford and Carey and is easily the best receiver. I’m not sure I’m ready to trust Langford as a starter yet or Carey to do more than he’s currently doing. • I know some fans are obsessed with assigning positions to players, but I don’t think referring to Eddie Goldman as a nose tackle is accurate. He lines up there in the base defense, but how often are the Bears in their base? If you’re looking for comparisons to the 49ers defense that Vic Fangio was the architect of, Goldman is Justin Smith. He’s not playing at that level quite yet, but there’s a good chance he’ll get there. Now the Bears need their version of Ray McDonald (the player, not the person) and their defensive line will be mostly set with the team playing two down linemen most of the time. • I don’t know who should get the credit for this, but one area the Bears have greatly improved is how they react when a play breaks down. Cutler has always been able to buy time, but the Bears receivers haven’t known how to act. Now, they make themselves available by running to open spots and Cutler finds them. • I know he says a lot of dumb stuff, but I enjoy Matt Millen’s announcing. He just sounds like a guy who loves football and has fun doing his job. • The coach the Bears can least afford to lose: Ed Donatell. Look at the improvement Kyle Fuller has made, the solid play from Tracy Porter and the fact that they’re getting good play from two undrafted rookies and a fifth-rounder. Donatell should be a defensive coordinator next year. • It’s impossible to say how his career will end up but Jameis Winston reminds me of Brett Favre. He has a cannon arm and is always willing to take a chance, but will make mistakes. • Sunday will be an interesting game for Jim Bob Cooter. It’s a job interview for him, maybe for both teams. There are numerous levels to this. First, if the Lions fire Jim Caldwell and Adam Gase gets a head job, the Bears could bring in Cooter to replace Gase. (Fox tried to interview Cooter before hiring Gase last offseason and they worked together in 2013.) Of course, there’s also a rumor that Gase is being considered for the Lions job, should they move on from Caldwell. Since they’ve worked together in the past, Gase could elect to retain Cooter. The Lions could also elect not to fire Caldwell, who would then likely choose to keep Cooter as his offensive coordinator. • Draft position be damned, this is a big game for both teams. 6-10 is bad, 7-9 in mediocre. The difference shouldn’t be considered to be all that much, but it is. Subconsciously, when you see the numbers you see a significant difference, it’s automatic. For the Bears, climbing from bad to mediocre in just one season would be a major accomplishment and going into the offseason with a win is always good for a team trying to create a culture. For the Lions, 7-9 could save Caldwell’s job. Detroit ownership is known for being loyal and I think they’d have a hard time firing a coach who has gone 18-14 in two years. Seven wins would tie for the third most they’ve had since 2001. If they go 6-10, however, it looks like more of the same. Why are so many Bears fans and some media members saying trading Brandon Marshall was a mistake? We know the drill. He starts out well, is a good soldier and follows the rules. Then he bends them. Then be breaks them. Marshall tried to divide the locker room. The Bears had to get rid of him or Cutler. They made the right call. There is a football aspect to this too. They want their receivers to be able to stretch the field and make plays after the catch, two things Marshall hadn’t shown he could still do. He lost weight and has been better in that area this year. Would he have done so if he was returning to the Bears? If you talk to anyone who has been close to the team, they make it clear: Bears don’t miss Marshall. It’s easy to focus on the good things he provides, but don’t lose track of the bad things. And, remember, the pick they traded him for became Adrian Amos, who would be considered a good rookie even if he had been a first rounder. Harold Jones-Quartey. When I watched the Cardinals crush the Packers, I admired their defensive backs. They had a bunch of guys who were fast and physical, something they definitely look for. They had HJQ in camp and, while it was always a long shot for the undrafted rookie from a Division Two school to make their talented roster, they tried to keep him on the practice squad. Last week, you saw exactly why the Cardinals liked him. He fits their profile and there’s definitely talent to work with. HJQ is raw and probably shouldn’t be playing this year. He’s a missile when he diagnoses a play, but gets confused too often. That’s something that he’ll be able to improve on and with a key interception and a forced fumble, he showed he’s capable of making big plays. He might never develop into a regular starter, but he has talent and it’s up to him and the coaching staff to maximize it. Lovie Smith. Lovie dropped to 0-2 against his former team with them beating him the exact way he wants to win this time around. The Bears got of the bus running the ball and forced turnovers. Maybe the best part is that they didn’t even need “Bear weather” to accomplish this. Lovie is in Year Two at Tampa, where he went because of his familiarity and the talent that was already on their roster. Since arriving, they have won a total of eight games and almost every major move he’s made has backfired. It looked like the Bucs were going to make a move when they were 6-6, but they lost three straight games to teams with losing records. They have talent. Winston isn’t great yet, but he makes two or three big plays a game and that should be enough with one of the best rushing offenses in the league and Mike Evans. 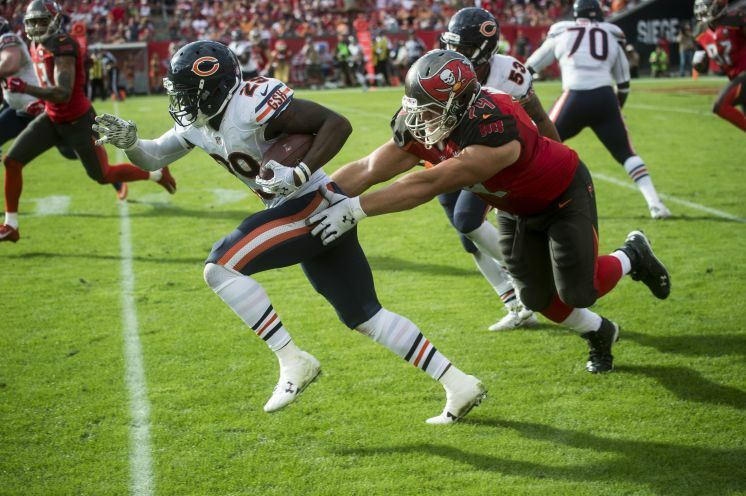 The problem is their defense, which Lovie was supposed to be able to fix. They just gave up 26 points to a team with no receivers and a terrible offensive line. Deonte Thompson breaks free for his first kick return touchdown. He’s averaging 32 yards per return, it has to happen, right?